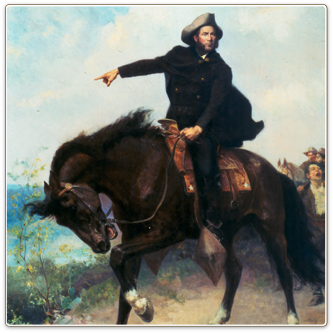 In many ways the father of Texas, Sam Houston’s role in the Texas Revolution started even before the first shot was fired. Houston was the most important figure in the Revolution, shouldering the burden of leading the Texas Army and eventually leading it to ultimate victory. He played a critical role in shaping and guiding the fledgling nation and leading it into the Union. Part Two covers the zenith of Sam Houston’s life and legend. Before we begin… What’s your favorite Texas based reality show? This famous painting of the Battle of San Jacinto by Henry Arthur McArdle hangs in the Texas Legislature chamber at the State Capitol in Austin. Sam Houston is featured in the center of the painting. Another famed painting from San Jacinto is by William Henry Huddle, and it depicts the famous meeting between the captured Santa Anna and the wounded Sam Houston. It also is on display in the Texas Capitol building, on the first floor of the south wing. Do you like the show? Do you like Sam Houston? Do you love Texas? Show your love for all three by purchasing one of these premium t-shirts quoting Sam Houston, Podcast Listener (probably).